I have just had an update from Allan Brew, the classic motorbike racer who my helicopter management company Luviair sponsors. 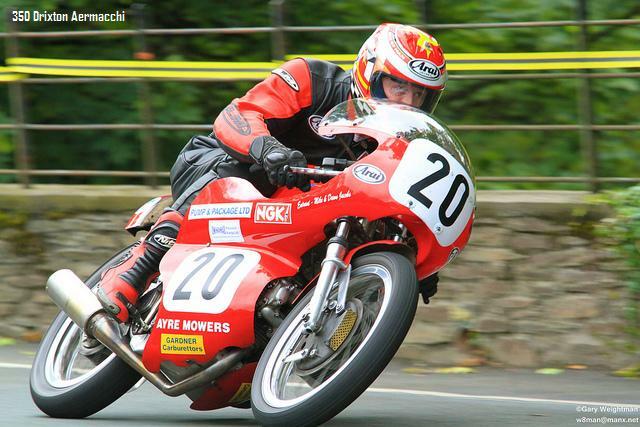 Alan races two classic motorbikes: an Aermacchi 350cc and a Seeley G50 500cc. “The first 10 started as per the program and then everybody else started based on their qualification times, so I started 15th for the 4 lap race. The conditions were good and I had a trouble-free race and finished 9th with a race average of 100.415mph. I was classified as a GP rider so received a bronze replica but would have won the privateers class if I’d have been classed ‘privateer’ !! I started 17th for the race on the Aermacchi and just hoped for a finish as I can’t remember the last time the macchi had completed the 4 laps. Again a trouble-free race, mainly on my own, apart from a couple of quicker Hondas passing. Eventually I finished 13th and received another bronze replica with a race average of 92.733, with my quickest lap of 92.998 beating my previous best. I was really chuffed to get a solid finish on the macchi but again disappointed with the GP classification as again I would have been 1st privateer in the single cylinder class.